Red alert in Madrid for the final of the Copa Libertadores. 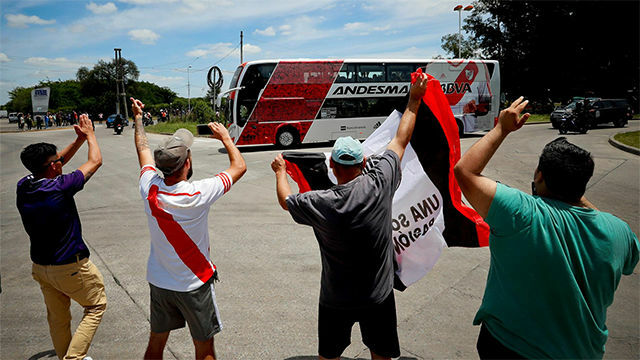 There is much concern because the Argentine authorities have allowed some of the most violent fans, the top boys of Boca and River, to travel without any restrictions to the Spanish capital. One of them, Rafa Di Zeo, the number one hooligan of La Doce de Boca, will embark to Madrid this Friday after the Argentine Justice issued the pertinent authorisation to leave the country. Specifically, the judge who gave the necessary permission was Sabrina Namer. With this authorisation, there is no legal impediment for Spanish immigration entities to refuse him entry to the country. Another thing is getting in to the Bernabéu. Although he has the ticket he needs, the security control will have the final word and Di Zeo appears in the list of Boca fans who have the right of admission ... without permission to enter the stadium. The 14 chiefs of La Doce and 8 or 9 of Los Borrachos del Tablón, the River firm, could travel to Madrid without problems. Although only with express authorisation they can leave Argentina - because of pending cases - it seems that everyone is getting permission. Other firms, as reported by Gustavo Grabia, the TyC journalist, have also traveled without problems, as in the case of Maxi Mazzaro, number 2 of La Doce until 2015. Be that as it may, Madrid is on red alert, where 12 Argentine officials will collaborate with the Spanish police: five policemen - the same ones who controlled them in the last World Cup in Russia - and seven civil servants from the ministry of security.